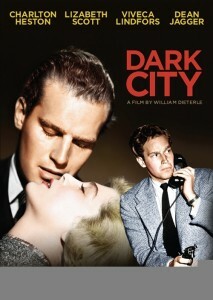 Dark City is one of five movies from the Paramount Pictures vault that Olive Films released on DVD on July 27, 2010. Olive’s project to release Paramount rarities is jumping around in the studio’s chronology and across genre lines, but three of these five releases are lesser-known film noirs. The best of the trio is this wonderfully seamy 1950 effort by German émigré William Dieterle, best known for Paul Muni’s biopics (The Story of Louis Pasteur, The Life of Emile Zola) and the gorgeous 1935 Midsummer Night’s Dream. Charlton Heston (The Ten Commandments) made his movie debut in Dark City‘s lead role of an amoral crook who participates in a poker game intended to fleece an out-of-town rube (Don DeFore, TV’s Hazel). When the rube commits suicide and his crazy, oversized brother (Mike Mazurki, Some Like It Hot) comes looking for Heston and his fellow crooks, the movie kicks into high gear. Heston’s sleazy character only begins to redeem himself very late in the film, so for the majority of Dark City, we’re following the exploits of a bunch of memorably shady characters. Dieterle worked beautifully with cinematographer Victor Milner (The Lady Eve) to craft arresting imagery, and the movie features an impressive array of character people, from incredibly earnest torch singer Lizabeth Scott to future Dragnet co-stars Jack Webb and Harry Morgan. The other Paramount noirs Olive released are Rudolph Maté’s atmospheric police procedural Union Station (1950) with William Holden and Barry Fitzgerald, and the Alan Ladd vehicle Appointment With Danger (1951), which also features Webb and Morgan as hoods hunting a murder witness who also happens to be a nun (!). Olive Films’ released another batch of Paramount archive movies on Sept. 28, 2010. Nice, insightful review, Ed. It’s great that Olive is unleasing some of this stuff!